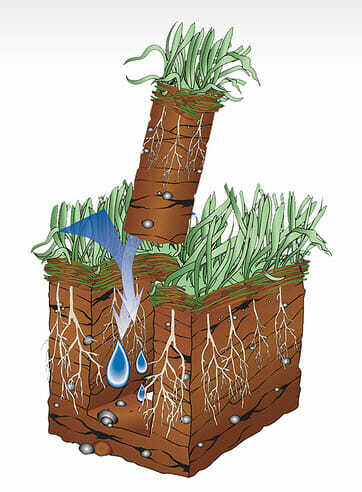 Lawn aeration, also known as core aeration, is the process of removing small soil plugs or cores from your lawn. Core aeration is usually recommended to help fight soil compaction on heavily used turf and limit the buildup of excess thatch. There are numerous hand aerators on the market, but most lawn aeration is done mechanically with a core aerator, which has tines mounted to a disk or a drum. A core aerator removes small cores of soil that are usually 1/2 to 3/4 inches in diameter. The holes left in your lawn from core aeration range from 1-6 inches deep and are usually spaced anywhere from 2-6 inches apart. Some aerators thrust solid spikes into your lawn without removing a core. This process is known as spiking; and it can further contribute to compaction.